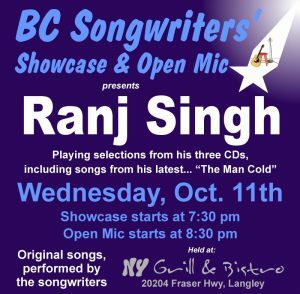 On Wednesday, October 11th, the Songwriter Showcase will feature the singer songwriter stylings of Ranj Singh. He will be playing selections from his 3 CDs, (including selections from his latest – “The Man Cold”), starting at 7:30pm. As always, Open Mic follows at 8:30pm, on a first signed up / first on stage basis. 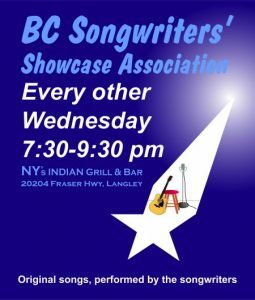 BC Songwriters’ Showcase & Open Mic performances are held at NY Grill & Bistro – 20204 Fraser Hwy, Langley.